Lady’s Slippers are also known as Moccasin-flowers and are a unique member of the Orchid family which require highly specific habitats in order to grow. They are VERY rare, so please do not pick or dig them up - in fact, it is against the law to do so. George Elliott and Gail Downs will be hosting a Lady's Slipper Walk on Saturday, June 1 at the Walden-Parke Preserve to share their knowledge of this beautiful wildflower. 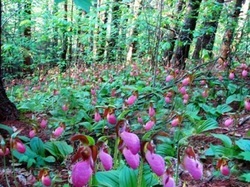 For the past three years they have seen hundreds of Lady’s Slippers on trails there - mostly pink and white ones. Join them at 10 am. The walk will begin and end at the kiosk at the end of Tamarack Trail (in Walden-Parke Preserve off of Essex Street). As the area is wet, we strongly suggest boots and bug protection. Remember to stay on the trails - take home only photos and memories in order to protect the delicate ecology of the preserve. Pink Lady’s Slipper: Leafless stalk usually bearing one flower, red veined, fissure down the front, approximately 2.5 inches long, height 6 – 15 inches. Leaves are up to 8 inches long. Lady’s Slippers are found from Nova Scotia to Georgia and Alabama to Tennessee. Showy Lady’s Slipper: Hairy, often twisted leafy stalk having 1 – 3 flowers with white and pink petals. The flowers are 1 – 2 inches long with white/rose-pink in front, often veined with purple or deep pink. Leaves are up to 10 inches and a height of 1 – 3 ft. They grow in swamps and moist woods. They are the tallest of northern orchids.